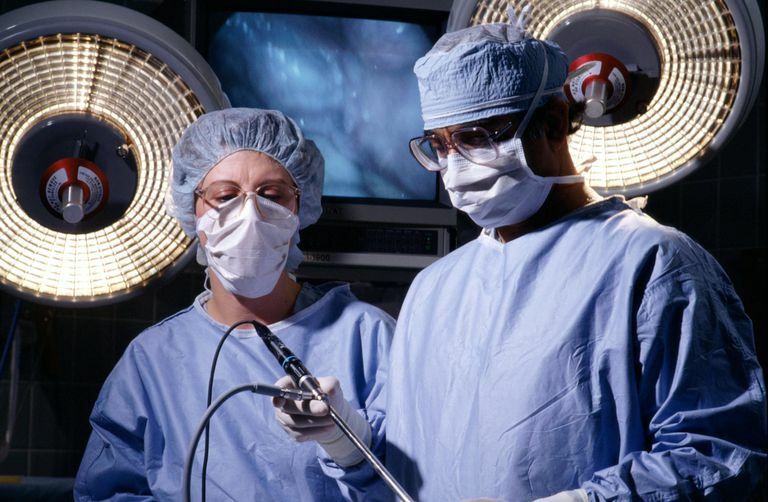 Laparoscopy is a minimally invasive surgical technique used in procedures such as tubal ligation, gallbladder removal, hiatal hernia repair, endometriosis excision, and uterine fibroid removal. These procedures are normally performed in the outpatient surgery unit of a hospital. In most cases, patients can return home a few hours after a laparoscopic procedure. Laparoscopy is usually performed under general anesthesia. A typical pelvic laparoscopy involves a small (1/2" to 3/4") incision in the belly button or lower abdomen. The abdominal cavity is filled with carbon dioxide. Carbon dioxide causes the abdomen to swell, which lifts the abdominal wall away from the internal organs. That way, the doctor has more room to work. Depending on the reason for the laparoscopy, the physician may perform surgery through the laparoscope by inserting various instruments into the laparoscope while using the video monitor as a guide. The video camera also allows the surgeon to take pictures of any problem areas they discover. Your surgeon may also decide to use the da Vinci surgical system. The da Vinci system is a robot that allows your doctor more precise movements and control. The surgeon performing the procedure works at a console, rather than handling the instruments directly. This type of robotic surgery is becoming more popular, especially for endometriosis excision procedures. Robotic surgery may require more incisions than traditional laparoscopy. In some cases, the physician may discover that he is unable to accomplish the goal of surgery through the laparoscope and a full abdominal incision, laparotomy, will be made. However, if this is a possibility in your case, your physician will discuss this with you prior to surgery, and the surgical consent form will include this possibility. Is There Any Risk Associated With Laparoscopy? Certain women face an increased risk, although this risk is the same as it would be with any surgical procedure. Those at risk include women who smoke, are overweight, use certain types of drugs, have pulmonary diseases or cardiovascular diseases, or are in the late stages of pregnancy. If you think you may fall into any of these categories, be sure to discuss your surgical risks with your physician. Although rare, perforation of the bowel or liver are possible complications that may occur during laparoscopy. Generally speaking, laparoscopy is safer than more invasive procedures. What Is the Recovery Period Following Laparoscopy? Depending on why the procedure is performed, most procedures do not cause significant pain and have a relatively quick recovery. Patients sometimes experience aches in the shoulders or chest following laparoscopy from the carbon dioxide that was used to fill the abdominal cavity. Although prescription painkillers are often ordered, Tylenol or Advil may be sufficient for pain relief. Often patients have the procedure on a Friday and are able to return to light work by Monday. Barring complications, most patients are fully recovered and ready to return to full activity one week after laparoscopy. When you leave the hospital, you will receive personalized instructions about when to call the doctor. Generally, you should call the doctor if you experience fever above 100 degrees Fahrenheit, excessive pain (not controlled by painkillers), or swelling or discharge in or around the wound. If your doctor has ordered a laparoscopy for you, be sure that you fully understand the reason they are recommending this procedure and how you can expect to benefit. Always ask questions before agreeing to any surgical procedure. ACOG Education Pamphlet AP061 - Laparoscopy.